KC Concepcion is one celebrity who tirelessly works to promote her advocacy of zero hunger. 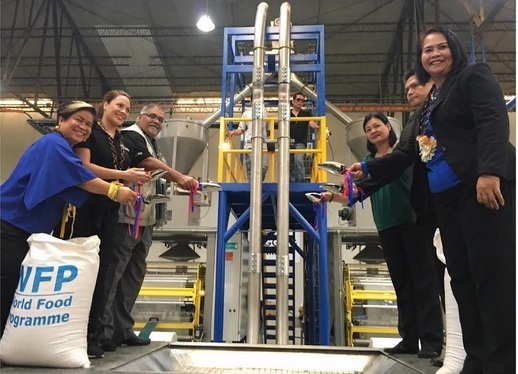 The singer-actress recently posted on Instagram a photo of her with officials of the Department of Social Welfare and Development (DSWD) and the World Food Programme (WFP), as they presented much-needed equipment for disaster response. The custom-built machines hasten the process of making relief packs, which usually requires so many man-hours from volunteers. According to KC, the machines are capable of making up to 100,000 relief packs a day. Computed at an average of five members per family, the relief packs can benefit 500,000 people when distributed immediately. With such speed, the packing system can spell the difference between life and death among victims of calamities. KC noted that the Philippines is one of the most disaster-prone countries in the world. Thus, the packing equipment will play an integral part in helping speed up the government's disaster response time. "We used to spend so much time for relief goods packing (i.e. during Typhoon Ondoy/Ketsana, Tropical Storm Sendong/Washi and Super Typhoon Yolanda/Haiyan). #WFP & #DSWD, together with Australia Aid & UK Aid, have now designed & developed a packing system that would enable our country to address the needs of producing family food packs in a timely manner. ❤️ Here behind us are machines that can make upto 100,000 relief packs for 500,000 disaster- affected people a day! Mother Nature... We're ready!!!" The post earned a lot of praise from netizens, many of them saying that aside from being beautiful, KC is kind and has helped a lot of people through her charity work. A lot of followers appreciate her humanitarian work. Some commenters are even suggesting that she should run for public office, so she could help more people. KC is a National Ambassador Against Hunger of the United Nation's World Food Programme. Her efforts as an ambassador for UN WFP was recognized at the 5th Outstanding Filipino Americans in New York (TOFA-NY), where she became a recipient of the Special Humanitarian Award.